SPEEDS UP THE REMOVAL OF SURFACE SOLIDS AND BOTTOM SLUDGE NATURALLY. Specially formulated for manure pits over slatted floors, outdoor manure lagoons and vertical holding tanks. 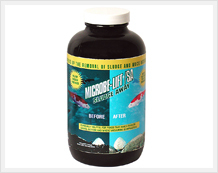 MICROBE-LIFT/SA (Sludge-Away) is formulated specifically for the removal of organic bottom or surface solids that are slow to degrade. Provides rapid, natural sludge and muck removal and works 80% faster than competitive products. Binds phosphate and helps with the liquification and nutrient enhancement of manure. Organic and microbial based. MICROBE-LIFT/SA is designed to be used with MICROBE-LIFT/Hog and MICROBE-LIFT/DFP (Dairy) to handle the most difficult manure management issues.